Not for nothing is chess known as “the game of kings.” No doubt the rulers of empires and kingdoms saw in the game fitting practice for the strategizing and forecasting they themselves were required to do when dealing with other monarchs and challengers. As we learn more about the brain, some are beginning to push for chess to be reintroduced as a tool in the public’s education. With benefits like these, they have a strong case. Chess has always had an image problem, being seen as a game for brainiacs and people with already high IQs. So there has been a bit of a chicken-and-egg situation: do smart people gravitate towards chess, or does playing chess make them smart? At least one study has shown that moving those knights and rooks around can in fact raise a person’s intelligence quotient. A study of 4,000 Venezuelan students produced significant rises in the IQ scores of both boys and girls after 4 months of chess instruction. Because the brain works like a muscle, it needs exercise like any bicep or quad to be healthy and ward off injury. 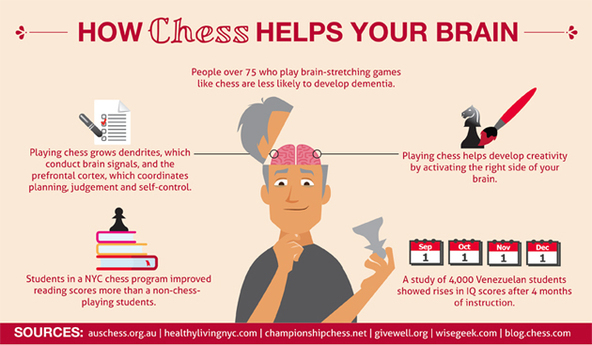 A recent study featured in The New England Journal of Medicine found that people over 75 who engage in brain-stretching activities like chess are less likely to develop dementia than their non-board-game-playing peers. Just like an un-exercised muscle loses strength, Dr. Robert Freidland, the study’s author, found that unused brain tissue leads to a loss of brain power. So that’s all the more reason to play chess before you turn 75. In a German study, researchers showed chess experts and novices simple geometric shapes and chess positions and measured the subjects’ reactions in identifying them. They expected to find the experts’ left brains being much more active, but they did not expect the right hemisphere of the brain to do so as well. Their reaction times to the simple shapes were the same, but the experts were using both sides of their brains to more quickly respond to the chess position questions. Since the right hemisphere of the brain is responsible for creativity, it should come as no surprise that activating the right side of your brain helps develop your creative side. Specifically, chess greatly increases originality. One four-year study had students from grades 7 to 9 play chess, use computers, or do other activities once a week for 32 weeks to see which activity fostered the most growth in creative thinking. The chess group scored higher in all measures of creativity, with originality being their biggest area of gain. Chess players know — as an anecdote — that playing chess improves your memory. Being a good player means remembering how your opponent has operated in the past and recalling moves that have helped you win before. But there’s hard evidence also. In a two-year study in 1985, young students who were given regular opportunities to play chess improved their grades in all subjects, and their teachers noticed better memory and better organizational skills in the kids. A similar study of Pennsylvania sixth-graders found similar results. Students who had never before played chess improved their memories and verbal skills after playing. A chess match is like one big puzzle that needs solving, and solving on the fly, because your opponent is constantly changing the parameters. Nearly 450 fifth-grade students were split into three groups in a 1992 study in New Brunswick. Group A was the control group and went through the traditional math curriculum. Group B supplemented the math with chess instruction after first grade, and Group C began the chess in first grade. On a standardized test, Group C’s grades went up to 81.2% from 62% and outpaced Group A by 21.46%. In an oft-cited 1991 study, Dr. Stuart Margulies studied the reading performance of 53 elementary school students who participated in a chess program and evaluated them compared to non-chess-playing students in the district and around the country. He found definitive results that playing chess caused increased performance in reading. In a district where the average students tested below the national average, kids from the district who played the game tested above it. Chess masters might come off like scattered nutty professors, but the truth is their antics during games are usually the result of intense concentration that the game demands and improves in its players. Looking away or thinking about something else for even a moment can result in the loss of a match, as an opponent is not required to tell you how he moved if you didn’t pay attention. Numerous studies of students in the U.S., Russia, China, and elsewhere have proven time and again that young people’s ability to focus is sharpened with chess. Dendrites are the tree-like branches that conduct signals from other neural cells into the neurons they are attached to. Think of them like antennas picking up signals from other brain cells. The more antennas you have and the bigger they are, the more signals you’ll pick up. Learning a new skill like chess-playing causes dendrites to grow. But that growth doesn’t stop once you’ve learned the game; interaction with people in challenging activities also fuels dendrite growth, and chess is a perfect example. Having teenagers play chess might just save their lives. It goes like this: one of the last parts of the brain to develop is the prefrontal cortex, the area of the brain responsible for planning, judgment, and self-control. So adolescents are scientifically immature until this part develops. Strategy games like chess can promote prefrontal cortex development and help them make better decisions in all areas of life, perhaps keeping them from making a stupid, risky choice of the kind associated with being a teenager.